I may have mentioned I have been reading an excellent volume, The Rag and Bone Shop of the Heart: Poems for Men. I come upon poem after poem that demands and commands my attention. I so much like this book that I purchased four copies, one for each son and one for my son-in-law. Last week I read an intense ‘poem’ by Mark Twain, “The War Prayer.” I am surprised that I have never read it before. A bit of wiki research reveals that the piece was not published until after Mr. Twain’s death. He had been advised not to publish it due to its controversial topic. The first link in this paragraph will take you to the entire “The War Prayer” piece as written by Mr. 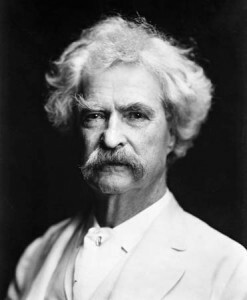 Twain; the second link will explain the background. A few days ago, I asked a good friend to read it. She read it with raised eyebrows. “He only presents one side of the story,” she commented. The back of the church was no place for controversy, so I let the comment pass. All the while, I was thinking, “There is no other side.” Here is the prayer. You decide. After reading the context, I’d like to share a quick story that happened to me when I was flying combat missions in SE Asia. My squadron commander and I were flying a mission together(OV-10s) in Cambodia. We had a lull in the mission, and I, for some reason, made a comment that, “God loves the North Vietnamese,too.” Later, my squadron commander and I became pretty good friends. He told me my words shook him up but stayed with him. He eventually decided to become a personal believer in Christ and even became our FAC association’s chaplain. I think those words I said have some connection to what Mark Twain was saying. I am certain your connection is true. I have come to acknowledge what Franciscan Richard Rohr calls patriotic idolatry. God loves Afghans just as much as he loves Americans. God loves Muslims no less than he does Christians. Back to Mark Twain, there is no just war.